This week we have seen the return of At Your Service to RTE1. 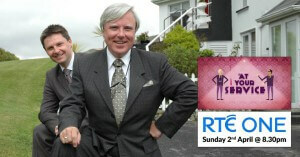 The show follows brothers John and Francis Brennan, of the Park Hotel Kenmare, as they travel the length and breadth of the country helping out struggling guesthouses, bed and breakfasts and hotels. Ballymaloe Foods are delighted to sponsor this brilliant show and we wish all the businesses featured in this year’s series the very best of luck in the future. To watch the show from The Republic Of Ireland on the RTE Player click here. Last Thursday we travelled to The Kingsley Hotel in Cork City for the M&P O’Sullivan Show which was fantastic. We were able to meet lots of our lovely customers and some of the other fantastic food suppliers in Cork. It was great to dust those cobwebs off and get back into the Trade Show mindset!